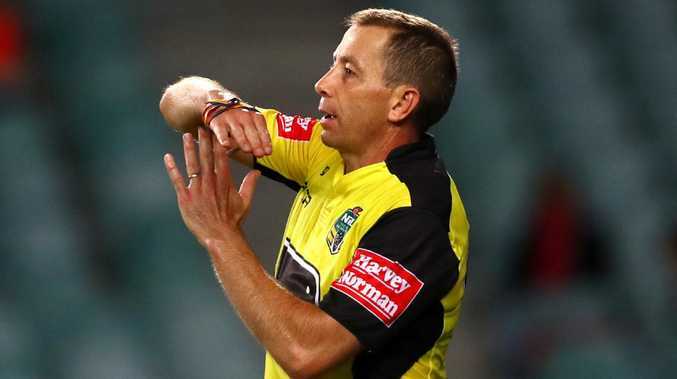 CANTERBURY has been fined $5000 fine over an alleged verbal spray by trainer Tony Grimaldi at an NRL referee during the Bulldogs' round 21 win over Brisbane. The NRL confirmed yesterday the Bulldogs had been issued a breach notice on Monday and had five days to decide whether to appeal the fine. It is believed Grimaldi said, "Why don't you ref the game fairly?" to referee Ben Cummins at half-time of the game at ANZ Stadium. Canterbury was also fined $15,000 for wearing the wrong jerseys during their round 19 loss to Parramatta, with both teams wearing hooped jumpers for the match. The penalties add to what has been a miserable season for the club, which is in a battle to avoid finishing with their first wooden spoon since 2008. The Bulldogs are in 14th spot but equal on 14 points alongside 15th-placed Parramatta and last-placed North Queensland with three games remaining in the regular season. Canterbury face the Warriors on Sunday, before rounding out their campaign against St George Illawarra and Cronulla - all of which are in the top eight.